Woobm-USB (Wireless Out Of Band Management) is USB device, that provides Serial port functionality over wireless bridge. Connect the Woobm-USB device to your MikroTik, Linux or other device and configure it wirelessly without the need of any serial cables. It also provides CLI configuration possibility to laptops without serial port, mobile devices and tablets. Woobm-USB has built in webpage for easy access and configuration. The device supports Access Point and Client modes. Connect your Woobm-USB to the USB port, open wireless network with SSID: WoobmAP will be created. Connect to device and open devices IP address in web browser. Device running RouterOS will automatically mount it as serial USB device and provide access after successful login. WEB interface allows access to serial port from devices equipped with 802.11b/g/n 2.4GHz wireless module. By opening Terminal tab, Woobm-USB will try to emulate USB serial interface. On successful attempt "Connection successful! " message will appear above terminal window. You can enter commands from keyboard or use key buttons to send out commands through USB serial interface. Show keyboard will bring up keyboard on mobile devices. Extra buttons provide missing keyboard keys for mobile devices. Note: Only one USB serial terminal bridge may be emulated, If serial port is already used, error message will appear above terminal window. 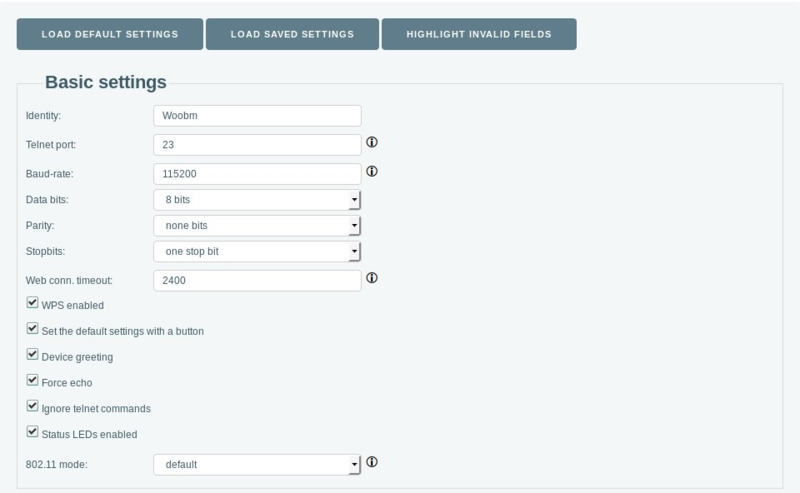 Settings tab provide basic configuration for Woobm-USB device. Basic settings part provide serial port, button, LED and wireless general settings. Identity (string; Default: Mikrotik) Device identity is used for DHCP client as 'host name' parameter when reporting it to the DHCP server, and for neighbour discovery. Baud-rate (integer; Default: 115200) Baud rate used for serial communication. Should match host device. WiFi Station settings part provide settings wireless for Woobm-USB in client mode. SSID (string; Default: ) Provide SSID of nearby Access Point, or use scan function. 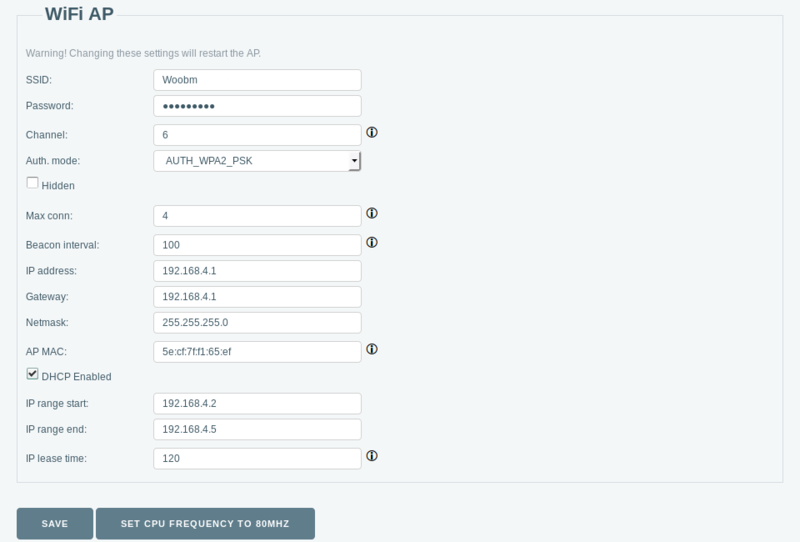 WiFi AP settings part provide wireless settings for Woobm-USB in Access Point mode. Max conn (1 to 4; Default: 4) Maximum allowed clients to Access Point. Beacon interval (100 to 60000; Default: 100) How often Access point broadcasts AP information. Use upgrade firmware tab for manual firmware upgrade. It's possible to use Telnet clients to access serial port. 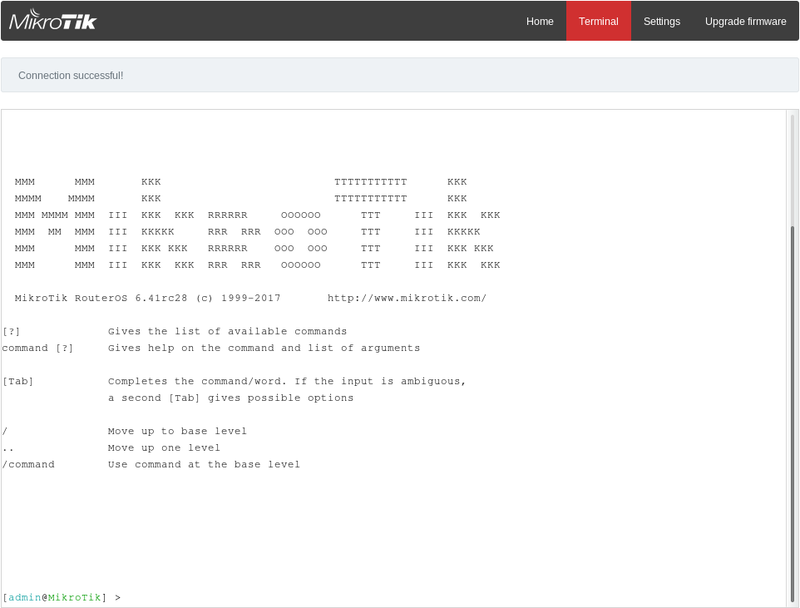 For Telnet access open Woobm-USB address in telnet client. Woobm-USB forwards serial port to telnet client. Note: Only one instance of serial port bridge may be emulated. Button provides functionality for enabling WPS, reset configuration and send out neighbour message (MNDP). If button is pressed for less than 5 seconds - WPS mode is enabled. If connection is made to Access point - Woobm station configuration is saved and old data is overwritten. 3) Attach Woobm to the USB port while holding button. Device will reset be reset to the default configuration. Neighbour message is sent out automatically every minute. To send message out manually hold button for at least 5 seconds until the LED light stops blinking. This page was last edited on 14 September 2018, at 18:14.